Basic ingredients: A welcome newcomer to Scotland’s culinary scene, ENTCS is a slick operation run by Fiona Burrell and a team of mainly female chefs, similar to London’s Leiths in its model. The school is based in the city centre, ranged over five floors with excellent facilities and a demonstration theatre that fits 50 people. 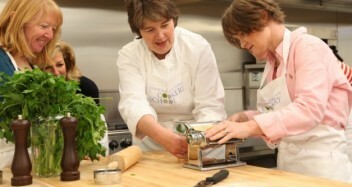 On the menu is a broad spectrum of cookery courses and activities for both home cooks and serious chefs. For example, there are baking and tapas day courses (priced about £150) as well three-month certificate and six-month diploma courses. They say: We teach classic and creative cookery in a professional but informal atmosphere. We say: The Beginners courses run over several weeks and two to three day Essentials workshops offer both a good grounding in the basics of cooking and value for money. The Wine School wing of the operation is run by Tom Bruce Gardyne. Oh, and don’t forget to check out the panoramic views across the Firth of Forth. Can you please find me a good starter cook course for my (retired, non-cook) husband? Nothing too fancy but some everyday favourite recipes… I plan to give him this opportunity as a Birthday present; look forward to hearing from you with details of dates, prices etc. Thank you for your query about the courses for your husband. A one day course that would be ideal for him is the Knife Skills and Cooking Techniques course. This covers which knife to use for each job, how to sharpen knives and the best methods to use for chopping. Then we cover basic techniques like how to sweat vegetables to get the most flavour, how to brown meat correctly, how to prepare and cook fish. They cook their lunch and in the afternoon they carry on cooking and pack up these dishes to take home. The cost of this course is £150 and it lasts from 9.45 am – 4.00pm. The next course with availability is on 14th July (the one in February is full). If he would prefer a course that covers a particular type of food we also have a Curries from Around the World course on 19th May and a Thai Cookery Course on 7th July both are £150 for the day. If he has time to do a longer course, the Three Day Cooking Essentials Course would be perfect for him as we teach all basic skills such as above on the Knife Skills course but also how to make pastry and sauces and other skills such as baking and roasting etc. The next course is 11th – 13th April and the course costs £410. If you look on our website http://www.entcs.co.uk and click on the view calendar button on the right hand side of the home page it lists all the courses coming up. If you would like any further information or advice please call the school 0131 226 4314. I am a primary school teacher in Edinburgh and looking for an opportunity to take a class to a cookery school and learn how to make something healthy. I don’t know how viable this is, but our topic is about healthy eating and fitness. We don’t have the facilities to cater for 32 pupils but can only hope that a visit to your school would be possible. Any ideas or help would be greatly appreciated. The level of tuition provided along with the depth of knowledge, immense encouragement and unlimited patience offered by the ENTCS is second to none. Having completed an intensive 3 month course at the ENTCS, I decided to pursue a career in the kitchen. I now work for some of the world’s most celebrated individuals. Not a day goes by where I dread going into work. Without the help I received from the ENTCS team- Fiona, Tor, Jess, Michelle, Dawn, Hilary and Nicky, I wouldn’t be where I am today. The ENTCS has given me the necessary culinary skills and confidence to really enjoy cooking both for myself and for others. I would not hesitate in recommending the school to anyone else looking to learn to cook (at beginner level) or searching for a change in career. I am 13 years old and this was my first cookery course. It was fantastic! The teachers were brilliant and great fun. I made everything from bread to meringues, soups and main courses. My family were amazed. I fed everyone at home all week. I would love to go back. Thanks to Fiona and her great team. I would recommend this cookery school to everyone wanting to learn to cook. What a week! I’d like to vote for Edinburgh New Town Cookery School. I spent a very enjoyable day there learning about Mediterranean Cookery.